53 w w w . M o d e r n T i r e D e a l e r . c o m MTD: Is the Jeep Wrangler the "poster child" for the R/T market segment? Mathis, Atturo: We believe the poster vehicle for the hybrid- terrain segment would be a vehicle such as the Chevy Tahoe. is is a vehicle that can use this type of tire as an OE alternative, lied, leveled or even lowered. e adaptation of the hybrid tire on SUVs and beyond traditional lied trucks is where the growth in units and profit opportunity for dealers will be found. Jamieson, Cooper: The Jeep Wrangler is certainly a target vehicle for this kind of tire, but so is a Toyota Land Cruiser, a Ford Raptor, or a Chevy Colorado. is consumer is motivated by enhancing the look of their vehicle, perhaps retaining the on-road perfor- mance of their OE tires, but still having a great tire that can stand up to an occasional romp in the mud or a path over the rocks. Howlett, Falken: e Jeep Wrangler, although a great R/T tire candidate, is not the poster child. e target R/T vehicle is lied pickup trucks. Gode, Hankook: at is a good assess- ment, although there are a few other vehicles that might also fall into that category. Stotsenburg, Kenda: We literally have a Jeep Wrangler on a Kenda Klever R/T poster. However, lied ½- ton and ¾-ton trucks are quickly gaining traction for the R/T segment. 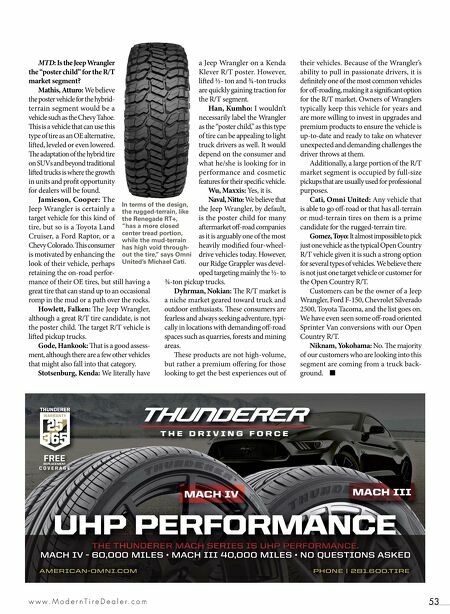 Han, Kumho: I wouldn't necessarily label the Wrangler as the "poster child," as this type of tire can be appealing to light truck drivers as well. It would depend on the consumer and what he/she is looking for in performance and cosmetic features for their specific vehicle. Wu, Maxxis: Yes, it is. Naval, Nitto: We believe that the Jeep Wrangler, by default, is the poster child for many aermarket off-road companies as it is arguably one of the most heavily modified four-wheel- drive vehicles today. However, our Ridge Grappler was devel- oped targeting mainly the ½- to ¾-ton pickup trucks. Dyhrman, Nokian: e R/T market is a niche market geared toward truck and outdoor enthusiasts. ese consumers are fearless and always seeking adventure, typi- cally in locations with demanding off-road spaces such as quarries, forests and mining areas. ese products are not high-volume, but rather a premium offering for those looking to get the best experiences out of their vehicles. Because of the Wrangler's ability to pull in passionate drivers, it is definitely one of the most common vehicles for off-roading, making it a significant option for the R/T market. Owners of Wranglers typically keep this vehicle for years and are more willing to invest in upgrades and premium products to ensure the vehicle is up-to-date and ready to take on whatever unexpected and demanding challenges the driver throws at them. Additionally, a large portion of the R/T market segment is occupied by full-size pickups that are usually used for professional purposes. Cati, Omni United: Any vehicle that is able to go off-road or that has all-terrain or mud-terrain tires on them is a prime candidate for the rugged-terrain tire. Gomez, Toyo: It almost impossible to pick just one vehicle as the typical Open Country R/T vehicle given it is such a strong option for several types of vehicles. We believe there is not just one target vehicle or customer for the Open Country R/T. Customers can be the owner of a Jeep Wrangler, Ford F-150, Chevrolet Silverado 2500, Toyota Tacoma, and the list goes on. We have even seen some off-road oriented Sprinter Van conversions with our Open Country R/T. Niknam, Yokohama: No. e majority of our customers who are looking into this segment are coming from a truck back- ground. ■ MACH IV MACH III THE THUNDERER MACH SERIES IS UHP PERFORMANCE. MACH IV - 60,000 MILES • MACH III 40,000 MILES • NO QUESTIONS ASKED AMERICAN-OMNI.COM PHONE | 281.600.TIRE THE THUNDERER MACH SERIES IS UHP PERFORMANCE. THE THUNDERER MACH SERIES IS UHP PERFORMANCE. THE THUNDERER MACH SERIES IS UHP PERFORMANCE. 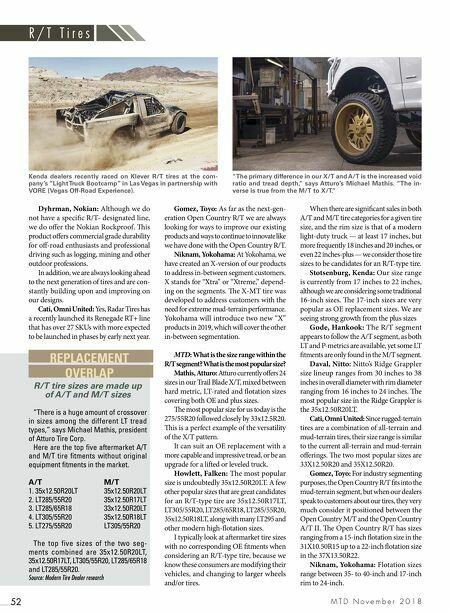 UHP PERFORMANCE In terms of the design, the rugged-terrain, like the Renegade RT+, "has a more closed center tread portion, while the mud-terrain has high void through- out the tire," says Omni United's Michael Cati.